CoQ10 for enhanced absorption every day! 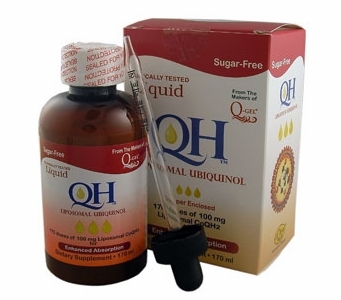 Sugar-Free Liquid QH� Liposomal Advanced Ubiquinol (the Activated CoQ10) is a Bio-enhanced Liposomal Ubiquinol Coenzyme Q10 formulated for enhanced absorption. This ADVANCED UBIQUINOL, (first available in March 2009), Liquid QH� Liposomal Ubiquinol from the makers of LiQsorb� (Liposomal Ubiquinone CoQ10) and Q-Gel� Coenzyme Q10 is now available for mito patients and others in a 170 ml bottle and delivers 100mg Liposomal-Advanced Ubiquinol CoQ10 per 1 ml. The 170ml bottle includes a dropper for easy, accurate dose measurement. Each 170ml bottle contains 170 doses of 100mg Liposomal Ubiquinol CoQ10. There are 17,000 mg of Advanced Ubiquinol CoQ10 per 170 ml bottle. This is a VERY powerful liposomal Ubiquinol CoQ10 and is not flavored. To make it palatable, add 1 ml to 6 to 8 ounces of your favorite juice, smoothie or milk shake for a delicious treat supplying 100mg of hydrosoluble Ubiquinol Co-Q-10. Compounding: liQH is ideal source of Ubiquinol for compounding due to our stability patent. 3 years shelf life from time of manufacturing. as a concentrated source of solubilized Ubiquinol Coenzyme Q10. Directions: Add 1 ml to your favorite juice, smoothie or milk shake. Storage Instructions: Keep bottle tightly closed. Store in a cool, dry place at controlled room temperature 15˚-30˚C (59˚-86˚F). DO NOT REFRIGERATE. Q-Gel�, CoQPure�, and Active Q� are registered trademarks of Tishcon Corp.
Hydrosoluble� and Bioenhanced� are registered trademarks of Tishcon Corp.